CIO Career Path: Responsibilities, Skills, Salary, and More! When it comes to careers in technology, the position of CIO is one of the highest positions you can hold. A CIO (also known as a Chief Information Officer), is the executive in charge of all things technology and the IT team. The CIO career path requires a significant amount of education, on-the-job training, and knowledge of how to operate a business. So, what does the CIO career path entail? For starters, it takes a lot of education. The minimum requirement for a CIO is a Bachelor’s degree, but that’s typically only the beginning. Many CIOs have additional technology-related certifications in project management and information technology. The pay off for the hard work (this career goal can take ten years or more), is substantial. On an average, CIOs take home around 162k per year while those in Fortune 500 companies make even more. Salaries also vary based on location, company size, and industry. If you’re interested in becoming a CIO, this is the career path you can expect. A CIO (Chief Information Officer) is an executive within a corporation that is responsible for overseeing information technology. That can mean many things depending on the organization. Typically, a CIO is in charge of hardware and software project implementation, vendor procurement, determining IT strategy, and delegating day-to-day IT operations. In most companies, the CIO reports directly to the Chief Executive Officer (CEO), and in many cases is a member of the board. They’ll handle the IT budget for the entire company and make hiring decisions. On top of that, they also determine safety and security measures related to overall company information. For example, CIOs play a crucial role in a company’s business continuity plan. It’s a big job, one that comes with a great deal of responsibility, and requires insight and knowledge into IT operations. Not only do CIOs need to have a mind for business, but they have to have an in-depth understanding of all aspects of technology. Let’s break down a little further what a CIO is responsible for within a company. Let’s take a more in-depth look at what each one of these responsibilities involves. The budget in most companies is calculated based on a percentage of company revenue. This also varies depending on the industry. A CIO’s budget will largely be determined by both revenue and how big of an impact technology has on the business. 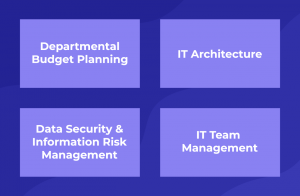 The CIO will be responsible for deciding how to use their budget, stay on track with their objectives, and effectively manage the growth of their workforce. A CIO is responsible for strategizing and implementing IT architecture across their organization. These plans will be based on the overall goals of the company and decided upon at an executive level. Once a strategy is in place, they’ll begin delegating tasks to their team to execute on each project. It requires a great deal of knowledge of IT operations as well as project management. Now, more than ever, data security and IRM are a big concern for CIOs. With so many corporations moving their technology to the cloud, developing a data security plan is a must. Some companies are positioning CIOs into an entirely new position that deals specifically with security known as a CSO (Chief Security Officer). The CIO must understand key vulnerabilities, educate employees on security protocol, and consistently be in-the-know about security issues all over the world. A CIO can’t do all this work alone. They’re in charge of the IT team and are frequently delegating many of the day-to-day tasks to them. Everything from implementing new software and hardware solutions, troubleshooting technology issues, managing IT expectations, and completing projects. Let’s say you need to choose a new business phone system. The CIO must be able to effectively manage large teams to understand the pros and cons as well ROI while setting up this new system. Now that you know the major responsibilities of a CIO, it’s time to talk about how you can gain this experience. The majority of CIOs are highly educated with a vast background in IT operations and business communications. 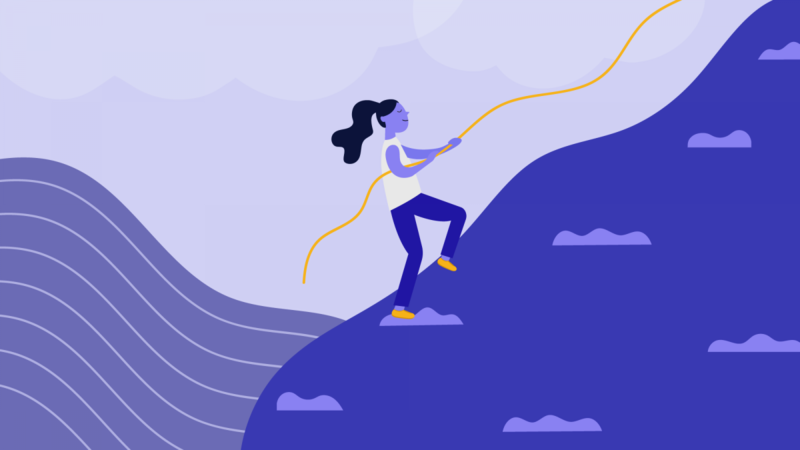 Most CIOs have exceptional leadership skills, knowledge of product offerings, study innovative technology solutions, and the foresight to re-engineer business strategies when necessary. This take-charge attitude comes thanks to the skills and knowledge they acquired via education and work experience. Most people on the CIO career path have a bachelor’s degree in information systems, computer science, or engineering. However, many go on to continue their education with an MBA or specialized certifications. Given that leadership and management is a huge aspect of day-to-day life as a CIO, incredible business acumen is also essential. Whether you develop that over time by steadily moving from one position to the next, or you study the skills of great leaders, it’s an absolute must. All that hard work comes with a payoff once you reach the top. 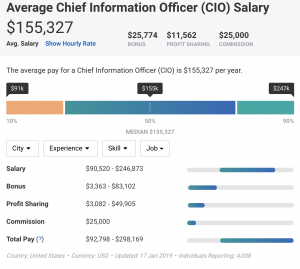 According to PayScale, the median salary for a CIO is $150,000 depending on location, industry, and company size. While the lower end of that number can come closer to $90,000, it can also exceed $250,000. If you’re looking to make a higher salary, you’ll want to be in a larger city like Los Angeles or New York. These numbers, of course, are all before bonuses and profit-sharing options. So, there are plenty of opportunities to make a good salary despite location. These days there is hardly a typical CIO career path. With ever-changing technology and new titles being used, everyone’s path is different. In fact, many CIOs hold the title of CFO (Chief Financial Officer), despite dealing primarily with technology. However, there are a few roles that are great stepping stones on the way to becoming CIO. What’s most important on the path to becoming a CIO is focusing on education, training, and developing leadership and business skills. Once you have enough experience under your belt, you’ll have a lot to offer when you step into those CIO shoes. If you’re looking for a safe and steady career path, the goal of becoming a CIO is a good one. According to statistics from the U.S. Bureau of Labor Statistics, employment for executives in the IT field is expected to grow by 12% through 2026 — much faster than most other occupations. Though the competition is fierce, with only so many CIO positions available throughout the country, there is still ample opportunity to work your way up in the technology industry. One thing is certain, technology is a booming industry for employment, so you can’t go wrong working hard and rising through the ranks.